A few mommy bloggers were invited to a round table discussion entitled “Schooling Generation Z” at Reedley International School in Libis, Quezon City last December 8, 2011. We were served brunch from Café France. I already had breakfast before I went to Reedley, so I ate only a little of what was served, but we (my son and I) finished everything at home. My son and I liked the Premiere Clubhouse Sandwich a lot. This is freshly baked whole wheat bread with crispy bacon, honey-cured ham and omelet. The Shrimp Pesto Pasta was a bit bland, though. E. Rodriguez Jr. cor. Greenmeadows Ave. This entry was posted in Breakfast, Cafe France. Bookmark the permalink. hmm..ginutom tuloy ako. 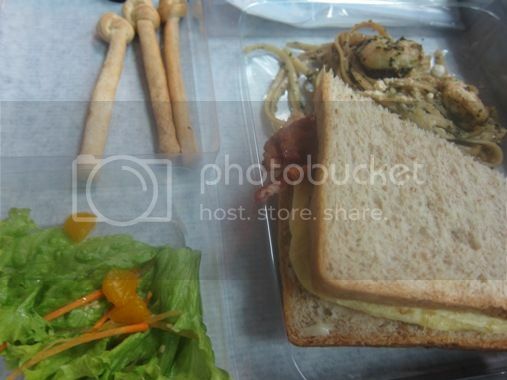 buti pwede palang i-take out hehe..sayang eh! Anyway, about my old FTF entry, di ka na talaga maka comment if the post is 10 days old na kasi, i closed the comment page after 10 days because of spammers. kakapagod mag bura hehe. ang kukulit nila. Thanks anyway for the visit.